So exactly a month and 5 days after our application for a joint bank account, I receive an e-mail alert from Credit Expert, saying a change was detected in my credit report. None of the options on the left sounded particularly encouraging I must say, and I knew, I just knew that my credit score must have taken a dive. How deep a dive was what was yet to be determined. Apparently, there are a whole range of actions that could affect your credit score negatively – and they don’t have to be negative actions like missing a payment. Matt Hughey’s credit rating dropped remarkably when he paid off a credit card he had since University, and closed the account. Commenters said that the problem was not paying off the card, but actually closing the account, so it’s about understanding the game, not just doing what you think is the right thing. 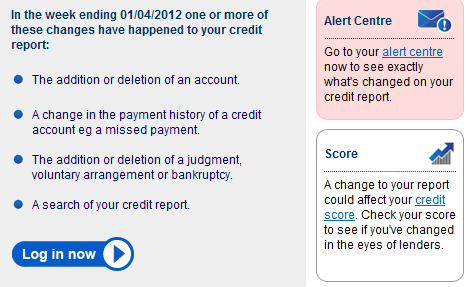 In my case, I found out that the ‘activity’ was opening the joint account – this reduced my credit score by 44 points! I don’t know how these guys allocate points – I thought they would deduct 1 – 3 points at a time, but it turns out they are on a different operating scale as the driving license point removers so I’m just ‘looking at them’ and trying to find more credit-boosting actions. Any suggestions? I’d need to verify with you here. Which isn’t one thing I usually do! I take pleasure in studying a put up that may make folks think. Additionally, thanks for allowing me to comment! A powerful share, I just given this onto a colleague who was doing slightly evaluation on this. And he in reality purchased me breakfast as a result of I discovered it for him.. smile. So let me reword that: Thnx for the deal with! However yeah Thnkx for spending the time to discuss this, I feel strongly about it and love studying extra on this topic. If doable, as you turn out to be experience, would you thoughts updating your blog with extra details? It’s extremely useful for me. Massive thumb up for this blog publish! I want to get across my love for your kind-heartedness giving support to those people that absolutely need help on the situation. Your very own dedication to passing the message up and down ended up being extraordinarily advantageous and have usually empowered employees like me to arrive at their desired goals. Your new insightful facts signifies a great deal a person like me and still more to my fellow workers. Thanks a lot; from all of us. I enjoy you because of your entire effort on this site. My niece loves going through research and it is easy to understand why. Most people learn all concerning the compelling means you make advantageous strategies via your website and therefore inspire response from people on the idea and our princess is without question starting to learn a lot of things. Take advantage of the remaining portion of the year. You have been performing a really good job. Respect to website author , some fantastic entropy. Rattling instructive and wonderful structure of articles , now that’s user genial (:. But wanna remark on few general things, The website style is perfect, the subject material is real fantastic : D.
its excellent as your other content : D, thanks for posting . Nice post. I learn something more difficult on completely different blogs everyday. It should at all times be stimulating to read content from different writers and apply a little something from their store. I’d favor to make use of some with the content on my blog whether or not you don’t mind. Natually I’ll offer you a link in your net blog. Thanks for sharing. I wish to get across my appreciation for your kind-heartedness giving support to visitors who should have assistance with the field. Your real commitment to passing the solution along appeared to be really effective and has really allowed individuals just like me to get to their objectives. Your entire interesting help and advice denotes a great deal a person like me and somewhat more to my fellow workers. With thanks; from all of us. I am only writing to make you know what a superb experience my wife’s child experienced viewing your site. She realized several things, which included what it is like to possess an excellent helping style to get folks effortlessly fully grasp several multifaceted subject areas. You undoubtedly surpassed her desires. Thank you for distributing those powerful, trustworthy, explanatory and unique thoughts on this topic to Jane. I want to point out my respect for your generosity for folks who need help with this important situation. Your personal commitment to passing the solution along ended up being surprisingly useful and has all the time made individuals like me to arrive at their aims. Your entire invaluable guidelines implies a great deal a person like me and especially to my fellow workers. Best wishes; from all of us.